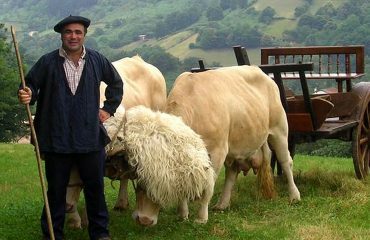 Venturing further than the Michelin restaurants San Sebastian so proudly presents to the world, more intrepid travellers find that the white-washed mountain villages of the Basque Country have some wonderful culinary secrets of their own. 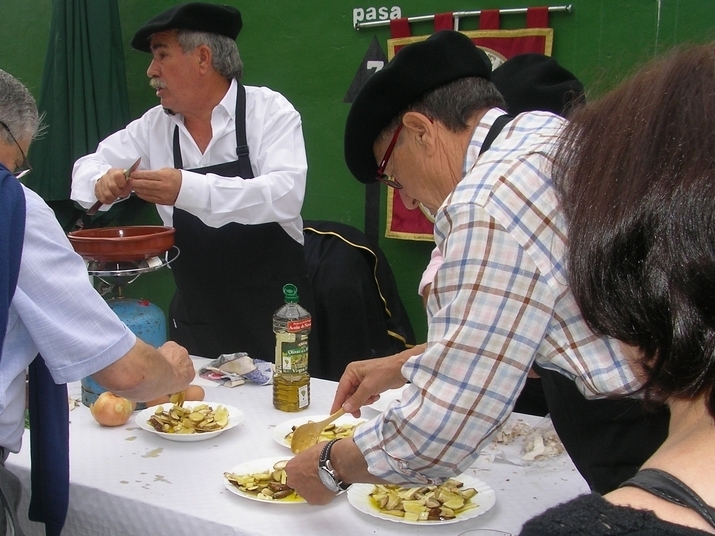 Apart from the cider festivals and mushroom fiestas, sheep’s cheese competitions and roast lamb banquets in village squares … you also find Michelin restaurants San Sebastian foodies know nothing about! Well, I suppose this is not surprising. Lorea´s and Haizea´s riverside restaurant at the bottom of our hill actually rejected its Michelin star (for reasons better asked them) and it seems to me that their sole existence is to bring pleasure to our lives offering us exquisite Michelin quality dishes at prices we can afford! 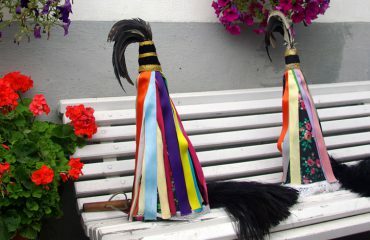 We have beaten a direct path down the mountain straight to their door and their duck confit with wild berry compote, coconut gazpacho or goat´s cheese salad with honey and walnuts are among our jealously-guarded secrets! Those who have followed Rick Stein´s campervan over hill and dale throughout Spain during his recent BBC documentary on Basque food will have some inkling of the bucolic mediaeval Basque landscapes that envelope the traveller within half an hour of leaving regal San Sebastian. Here mountain streams creak with the sound of water mills grinding the corn and village squares ring with the sounds of pagan figures clad in sheep skins and lace petticoats, warding evil spirits away from the crops with a thrust of bells and a flick of a whip. 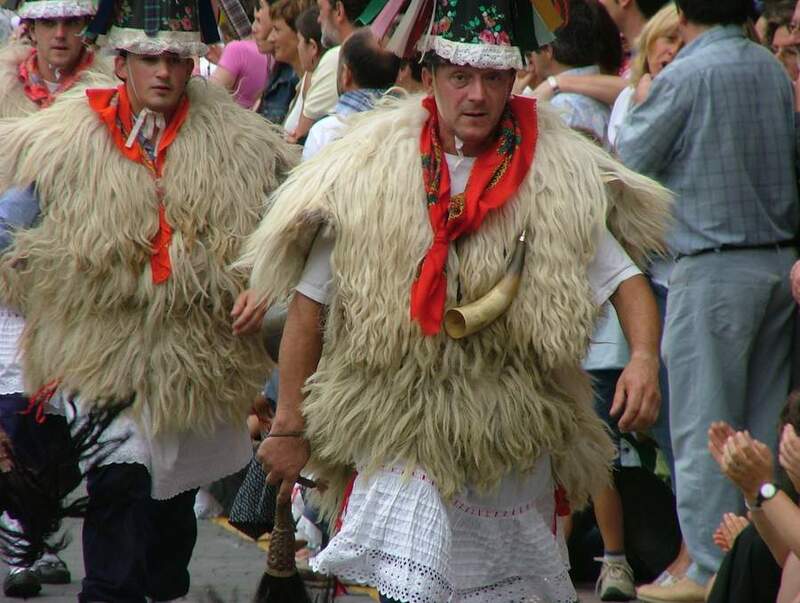 Only here is Basque cuisine still umbilically linked to its culture and traditions and anyone seriously interested in Basque food should definitely mark this area on the map … that is if you can find it! In our hamlet my neighbours still plant their tomatoes, chop their wood, sheer their sheep – and even cut their hair – by the phases of the moon. They pick sloe berries to make Patxarran, they make quince jellies and fig jams and – as a history of witchcraft belies – have a tradition of making herbal healing ointments from wild plants. Some people still tickle trout and, if you ask Kokili, he will tell you which plants they used to threw into the streams to anaesthetise the trout and make them easier to catch. On misty autumn mornings the locals will scour the forests for mushrooms and Felipe can tell you with just one look at the shape and colour whether your Boletus Edulis had sprung to life beneath an chestnut, oak or beech tree! One of the Michelin restaurants San Sebastian foodies know nothing about! 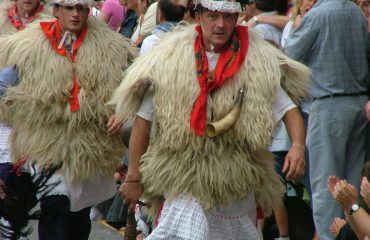 Here, the culture of the Basques is so deeply tied to the lands they have lived in since primordial times. And so if you do eventually track us down and join our Basque Gastronomy Walking Holidays you will find great Basque food at every turn. 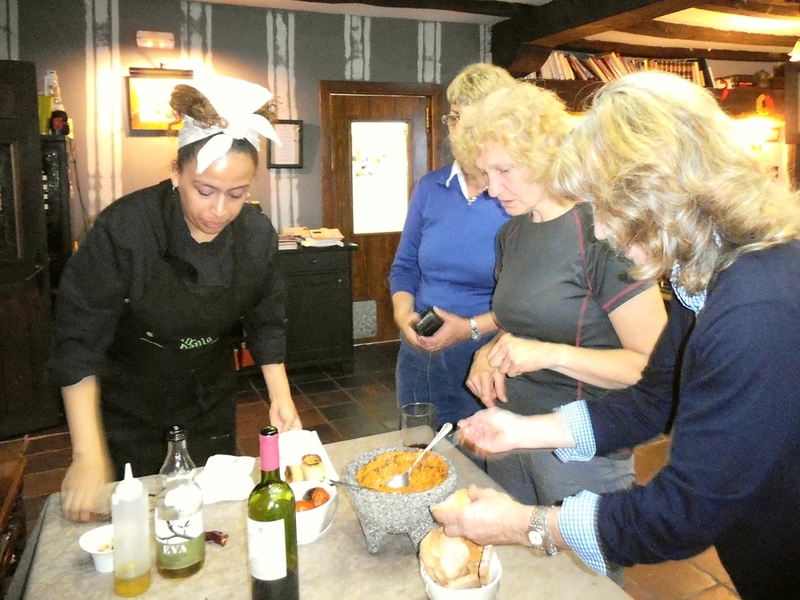 At Isidro´s farm you will find lentil and black bean stews bubbling on the stove over the winter months and at Sagrario´s farm next door, when the sheep stop lambing in the spring, you will find tangy, home-made sheep´s cheese and little clay pots of sheep´s milk junket with honey. At Felipe´s watermill down the valley do try the local speciality of toasted corn talos with cheese and spicy sausage (made on the farms) – best downed with the dry local cider from Lekaroz. 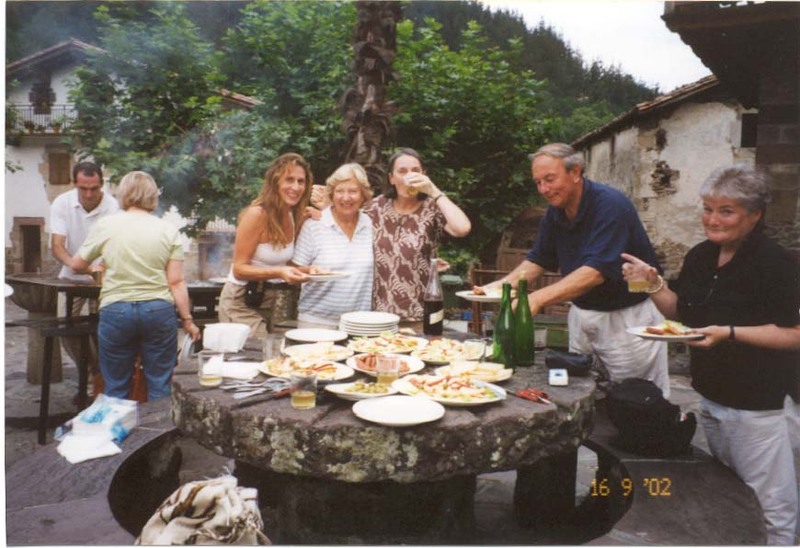 If the roast lamb on the spit at the local summer fiestas or the T-bone steaks and cod and pepper stews at the local cider house still don´t do it for you then it is back down the track to visit Lorea and Haizea at the bottom of our hill. After a Michelin quality lunch on a hot summer´s day we inevitably find ourselves siestering in their garden, toes in the river and thoughts of the Michelin restaurants San Sebastian so boasts about, far from our minds. 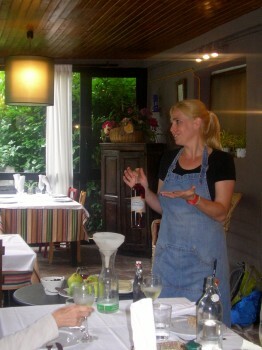 So happy to hear again about the Baztan valley, Georgina’s place and Lorea and Haizea’s Restaurant. Their parents are long-term friends of mine.